A hundred years ago, developers began construction on Munger Place, one of Dallas' first luxury suburbs, just northeast of downtown. By midcentury, the beautiful Prairie-style mansions had fallen into complete disrepair. Munger Place was a crime-ridden slum, a textbook case of inner-city decay. Demolition was coming. The urban pioneers got there first. In the 1970s, they looked at those houses and saw not ruin, but the potential for resurrection. They worked with bankers and city officials to re-zone the area, get historical landmark status and encourage preservation through regulations and incentives. A key to this movement was to think beyond the bounds of the Munger Place neighborhood and to work with the city to encourage good development in adjacent neighborhoods. Three decades and a billion dollars of investment later, one of Dallas' most blighted areas now celebrates its 100th birthday, reborn as a showcase of hope, a family-friendly neighborhood of national historical significance. No neighborhood is an island. Coordination is vital. Great things can be accomplished in this city when people work together to make something happen, instead of to prevent something from happening. Earlier generations of Dallasites didn't have any examples of what could be accomplished through historical renovation, making it easy to light out for the suburbs. Now they do. Drive over to Munger Place and see what a miracle looks like. 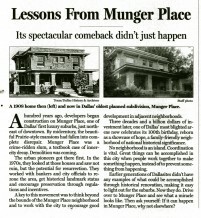 Then ask yourself: If it can happen in Munger Place, why not elsewhere?